OK, January in NYC and just finally snowed today after a freakishly warm couple of months that were supposed to be winter. And what I am thinking about? Mexico. 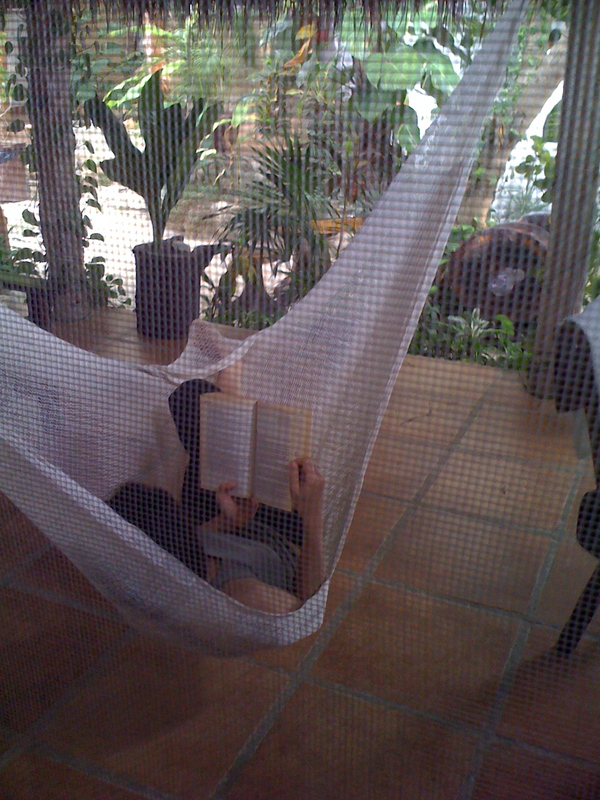 2 years ago exactly…laying in a hammock in an amazing little oasis in Tulum called Posada Yum Kin, which is the kind of place that once you discover, you have to work your entire trip around because you don’t want to leave. I have done a lot of tropical traveling in the last couple of years, but when I close my eyes and wish to be teleported off for a week to someplace utterly relaxing… this is where I think of. 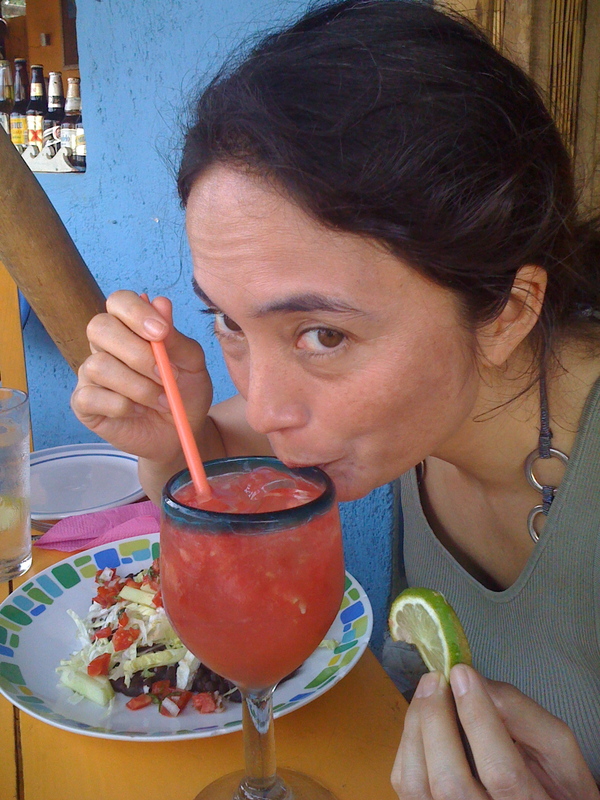 A hammock …and the watermelon margaritas at Salsalito Taco Shop. Not necessarily in that order. I also had some of the best chile rellenos I have ever had on that trip, at a place called Wet Wendy’s on Cozumel. It’s a margarita bar right in the middle of tourista-ville which was so tacky I am afraid to link you there, but if you are ever on Cozumel you have to go for their chiles, which are just huge, divine, deep-fried goodness. Apart from the name, this recipe has nothing to do with what they were doing. This is a hybrid between my mom’s chile rellenos, which she stuffed with a much lighter cheese mixture using fresh ricotta and onions, and my friend Linda Fry’s ingenious recipe which makes the whole thing into a baked casserole and avoids the nastiness of deep frying. 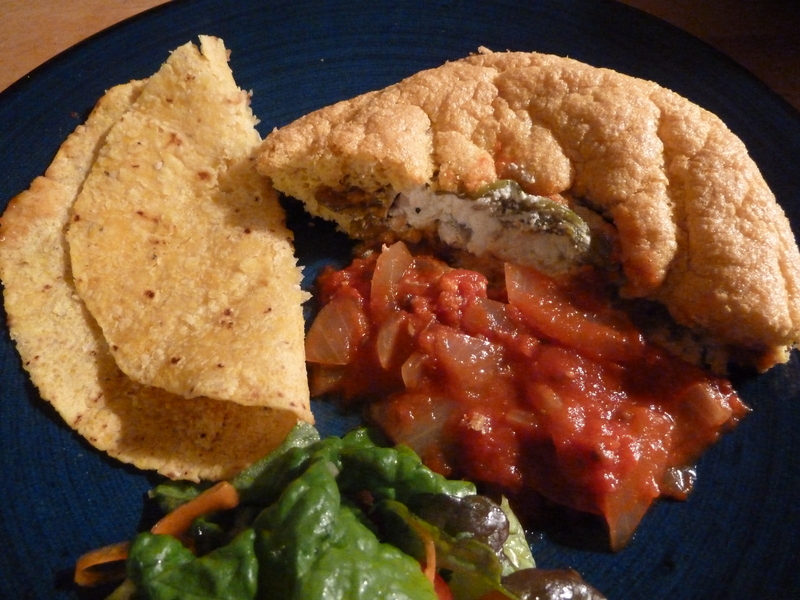 Served with a Warm Tomato-Coriander Salsa, it is fresh and heavenly. Oil a 9 -12″ casserole dish with olive oil or butter. Preheat oven to 400°. 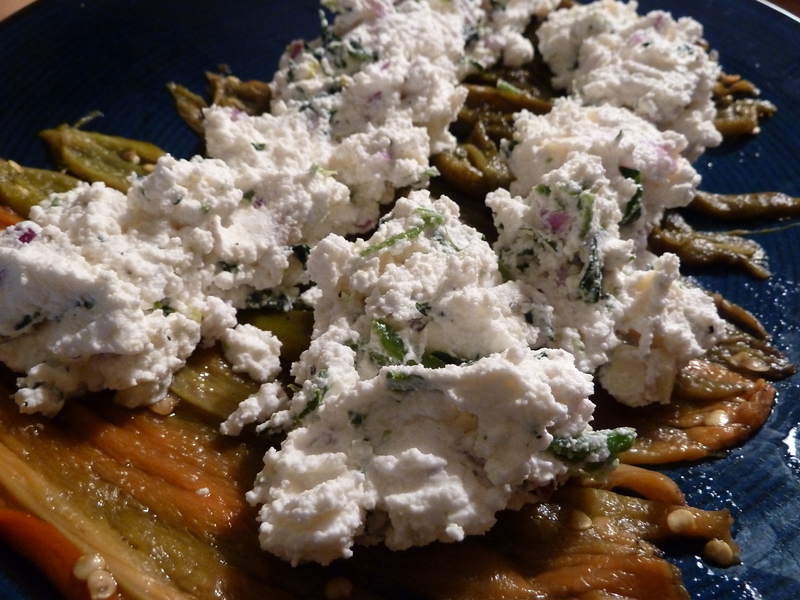 Stuff the Chiles: Mix together ricotta, cheese and red onions in a bowl. Stuff each chile with about 2- 3 tablespoons of the cheese mixture. 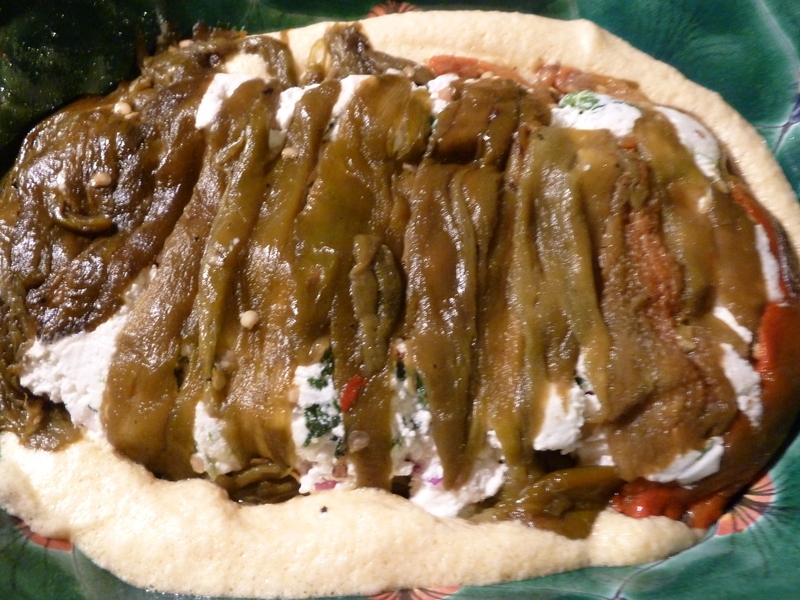 Alternately, you can open and spread half the chiles in a single layer on a plate, top with the entire cheese mixture and layer the rest of the chiles on top, like a chile-cheese-chile sandwich. What is important is that you have the filling stacked up and ready to go before you do the egg batter. Carefully separate eggs into two large metal or glass mixing bowls, making sure to keep whites completely free of any oil or egg yolks. Beat yolks and salt with a whisk (or electric beater) until very light yellow and fluffy, about 5 minutes. Add flour and water and whisk lightly just to combine. Fold whites lightly into egg yolks and spread half this mixture onto the bottom of your prepared casserole. 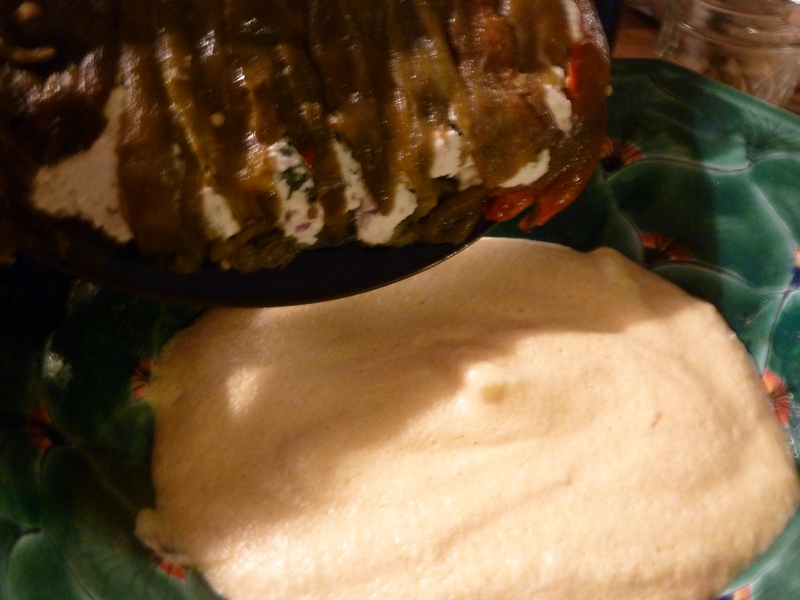 Not missing a beat, top with your stuffed chiles, laying them carefully in a single layer over the eggs. Top this with remaining egg mixture and back for 20 – 25 minutes or until top is golden brown and puffy. 1 can whole organic tomatoes (such as Muir Glen) or 8 fresh Roma tomatoes, peeled. Slice onion into 2″ strips. Using your hands, crush the whole tomatoes into a bowl, saving the juice. Heat oil in a saute pan, and toast whole spices for 10 -15 seconds until fragrant, add onions, salt and red pepper if using, and saute on med-high for 4 -5 minutes until onions are just starting to color at the edges. 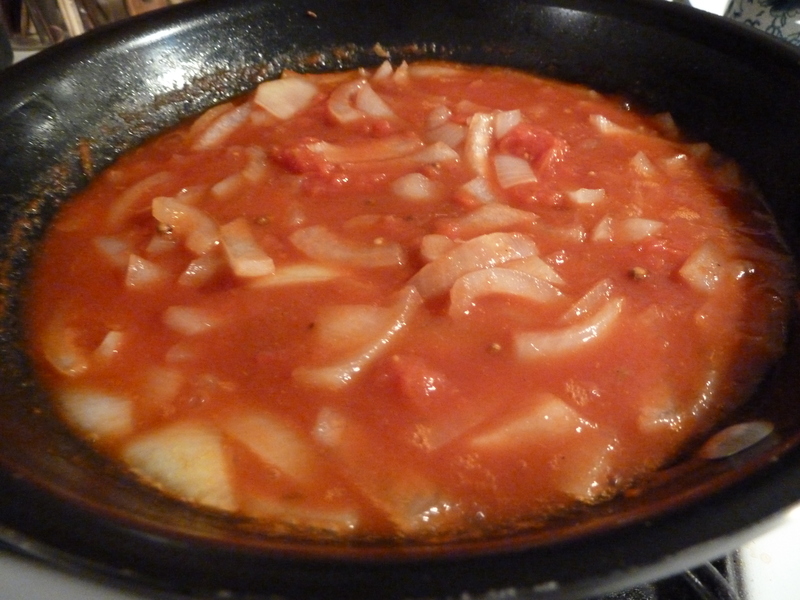 Add crushed tomatoes and juice and sauté for a few minutes before tasting and adding a touch of agave as needed. (The sauce should be just slightly sweet, but how much to add will depend on your tomatoes). Simmer gently for 10 -15 minutes to integrate flavors. Serve warm, adding whole cilantro leaves just before serving. Serve Chile Relleno Casserole drenched with a generous ladle of tomato salsa over the top. Awesome with a few sprouted corn tortillas, guacamole, and a big colorful salad on the side. *Roast the Chilies: I roast whole poblanos directly over the gas flame on my stove, turning to blacken all over, let steam in a covered bowl for at least 10 minutes, then peel and seed them. You can also lightly coat whole peppers in oil and pop them into a 450° oven until they are completely black on the outside, then do the same. Roasted and cleaned chiles freeze really well so do a lot and freeze in batches to enjoy in the winter. 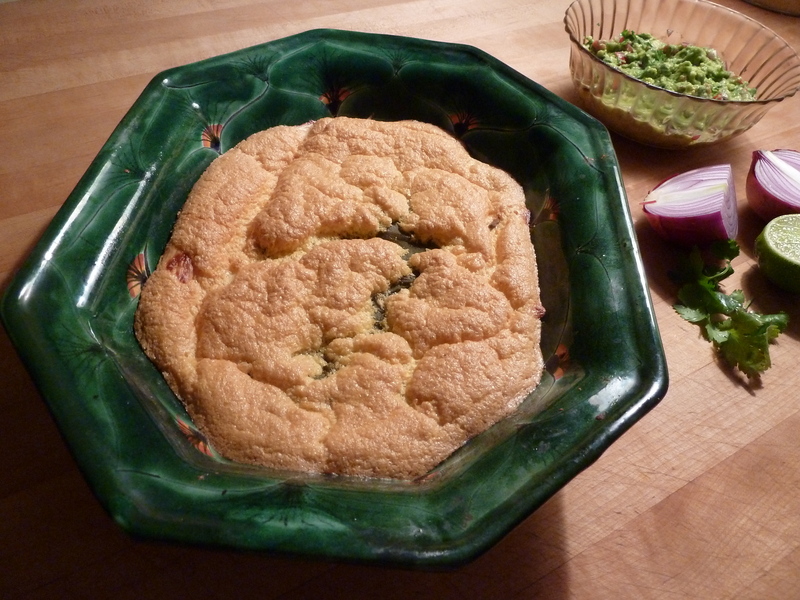 Or, you you can do what my mom always did, which is to use canned whole Ortega green chiles. If you do this, you might as well go totally deviant: use pepper jack cheese and spice up the sauce to give it some inside-out spiciness. Mmmm….